Clifton Forge, VA (April 4, 2019) - The public is cordially invited to spend an evening with best-selling author Julia Keller. Sponsored by the Clifton Forge Public Library in partnership with the Historic Masonic Theatre, the program will be held in the Theatre’s Westrock Room. It will begin at 7:00 p.m. on Friday, April 26. Admission is free. 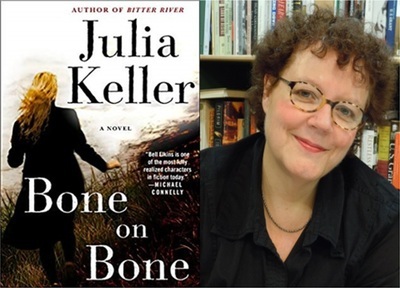 Winner of the Pulitzer Prize and longtime literary critic at “The Chicago Tribune,” Julia Keller is the author of “Bone on Bone,” the seventh novel in the critically acclaimed series set in a hard-luck West Virginia town that features a headstrong, haunted main character named Bell Elkins. “These days,” Ms. Keller says, “I contribute my own tales to this blissful, burgeoning bounty of books - books found in libraries and bookstores and web sites. I write mysteries and biographies. I write historical fiction and science fiction. Ms. Keller is also the author of “A Killing in the Hills;” “Bitter River;” “Summer of the Dead;” “Last Ragged Breath;” “Sorrow Road;” “Fast Falls the Night;” and, “The Cold Way Home,” which is scheduled for publication in August. All are titles in the Bell Elkins series. Her previous books include “Mr. Gatling’s Terrible Marvel: The Gun That Changed Everything and the Misunderstood Genius Who Invented It,” a nonfiction account of the life of the inventor of the Gatling gun; and, “Back Home,” a novel for young adults named by “Booklist” as a Top 10 Debut YA Novel of the Year. “Dark Star Calling,” the third book in her science fiction trilogy, “The Dark Intercept,” will be published in November. Ms. Keller earned a doctoral degree in English Literature at Ohio State University. She was a Nieman Fellow at Harvard University and McGraw Professor of Writing at Princeton University. She has also taught at the University of Notre Dame and the University of Chicago. She won the 2005 Pulitzer Prize for Feature Writing, and has served four times as a juror for the Pulitzer Prizes. Julia Keller’s program will conclude with a book signing. Copies of her book will be available for purchase. The Historic Masonic Theatre is located at 510 Main Street. For more information, call the Clifton Forge Public Library at 863-2519, or the Historic Masonic Theatre at 862-5655.